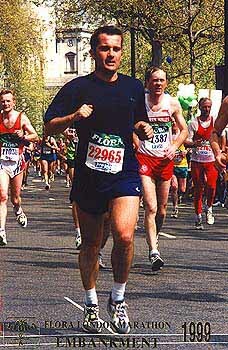 I ran my first marathon in 1998, and took a six month break afterwards from any running whatsoever. But because I had been suffering from the 'flu in the weeks before the marathon, I was pretty confident I could improve my time of 3 hours 29'. So, late in 1998 I made the decision to try again and began the long road to fitness again in Jamaica over Christmas. You can check my rough training plan here. This year, I also talked Gerd into running, so I had a training partner for the dark and cold winter evenings. The training went smoothly, although the monotony of running 80km a week began to get tedious towards the end of the training period. I also managed to keep healthy this year, and travelled to London feeling confident. After celebrating Kim's birthday (almost) alcohol-free, I retired early to bed. The day of the marathon was perfect running weather: 12 deg C with cloud cover and no wind. I lined up at the start line with Gerd, wished him luck and set off with 30,000 other runners. The first hour is just waiting time, so I enjoyed the unique atmosphere created by 30,000 runners and an estimated 500,000 supporters. The halfway point, at London Bridge is really impressive, as this is the first point where there is a really big crowd. Tactically, you aim to get to halfway still feeling comfortable, and I was exactly on schedule and feeling fine. At this point, you run towards the London Docklands, at the only point on the course where you later run back along the same road - as I crossed the mile 14 marker, the leaders flashed by on the other side of the road, approaching mile 21 (You do the math!). My only lasting impression, apart from thinking "those lucky bastards, so close to the finish", was how small all the top stars are: most of them are obviously skinny buggers, but they are particularly small, too. The hardest point for me this year was between miles 15 and 20. I think this is just a mental issue, knowing you have already run a long way but still have a long way to go. It also doesn't help that the Docklands are the quietest part of the race. My schedule had a negative split, meaning I planned to run the second half about five minutes quicker than the first. However, I didn't have the courage of my convictions, and left the 'sprint' until mile 20. This year, although the last few miles are always really tough, I managed to speed up towards the finish. As you can see on the left, I was still going strong along the Embankment, at about mile 24. The last mile was literally a sprint, and it felt great to be able to speed up whilst those around me were starting to flag badly, pulling up with cramps. I crossed the finish line with a measured time of 3 hours 18 minutes (official time was slower due to time lost at the start), which was three minutes slower than my stretch target. 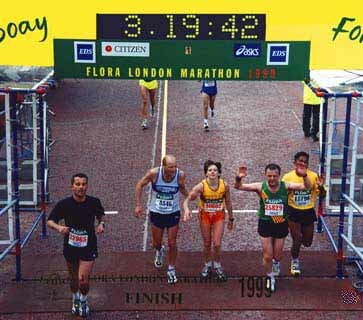 The woman in the picture to the right had collapsed just before the finish, and the two guys with her dragged her across the line. Gerd showed up at the finish about half an hour later. As is typical for a first marathon, he had suffered badly in the final miles, and lost about 15 minutes. Along with my posse of supporters, Elan Bassier met us at the finish, and was so impressed he insisted on buying Gerd and I a celebratory pint. I enjoyed mine, Gerd took one sip of his lemonade and promptly turned a shade of lime green. Michael Gurney also completed his first marathon, impressively (for a 65 year old!) under 4 hours. Gids also surprised his doubters by finishing, and to boot under the magical 4 hour barrier. His run was more eventful than mine: he was spotted by the Wolfe at mile 23, staggering around in an aimless stupor. Some blatant peer pressure and derogatory jeering soon got him going again though. Like last year, I couldn't use my legs properly for about four days. I also swore during the last miles this year that I would never, ever run another marathon. However, my conviction had waned somewhat about an hour later, and as I already have an entry for 2000, who knows? If you are interested in entering a marathon, definitely start with a large event like London or New York for the unbeatable atmosphere. If you're tempted, click here for a basic training plan.